Thanks to travel rewards cards, it’s easier than ever to see the world at a price you can afford. With the right combination of frequent flyer miles, hotel points, and flexible travel credit, you can piece together a once-in-a-lifetime journey nearly anywhere, stay in luxurious accommodations, and save 80 percent or more of the cost of your trip. Unfortunately, there are numerous pitfalls that make travel rewards difficult to earn and redeem. Reduced award availability, higher costs for peak travel times, and limited time off work can even make travel rewards a difficult prospect for families. But, that’s why senior citizens are the perfect demographic for the travel rewards game. Retired consumers tend to have the time and credit required to make the most of this hobby, and they can breeze past many of the rules that make using travel rewards difficult for the average consumer. Families traveling with kids often struggle to use airline miles and hotel points since they can only travel during peak times when kids are out of school. But senior citizens? They may be able to travel when they want and avoid peak travel times altogether. As a result, seniors will find more award availability to almost anywhere when they go to cash in their rewards. While travel rewards cards can be lucrative, not everyone can qualify. You typically need very good or excellent credit (a FICO score of 740+) to qualify for the best travel rewards cards. Many senior citizens who pursue travel rewards have the distinct advantage of a having long and prosperous credit history behind them. In theory, this means they should be able to qualify for the most lucrative and useful travel rewards cards available. Pursuing credit card rewards is only a good idea if you’re debt-free and plan to stay that way. If you plan to carry a balance on your credit card, you should opt for a low-interest credit card instead of a travel rewards card, after all. 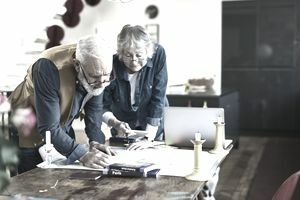 Seniors living a debt-free retirement are in the ideal position to pursue travel rewards since they likely own their homes and may not have to worry about big upcoming expenses like weddings or college. One of the biggest downsides of international travel for people in the workforce is that they may only be able to stay for a week at a time. For that reason, seniors with more free time have a huge advantage. Not only can they travel off-peak, but they can travel slower and take their time. Imagine having the option to spend weeks or months abroad instead of just 7 or 8 days at a time. This type of slow travel can be a lot less stressful, and it can create time for seniors to see and do things those with limited vacation time can only dream of. Instead of rushing to see all the sights and attractions, seniors can wake up when they want and explore their new destination on their own time. Finally, senior citizens don’t have to deal with the huge stress and inconvenience of planning travel around other people. There’s no such thing as PTO (paid time off) or vacation days when you’re happily retired, meaning you can travel when you want. This is a huge benefit for seniors since they don’t have to worry about planning around their co-worker’s spring break plans or the fact that their boss frowns on taking too many days off during summer. If you’re retired and wondering what’s next, it may be time to come up with a new list of goals. With the right combination of travel rewards cards, you could travel to new lands, explore the history of your own culture, or relax on some of the world’s most beautiful beaches. The options are only limited by your own imagination and your willingness to dive into the travel rewards game head first. What are you waiting for?